As part of our Jubilee year celebrations (which will climax on 5th/6th August 2014) a group of six oblates and friends of Prinknash Abbey came to spend ten days with us in March. Prinknash is our “mother-house” and we were happy to welcome back Fr Martin McLaughlin with the oblates. 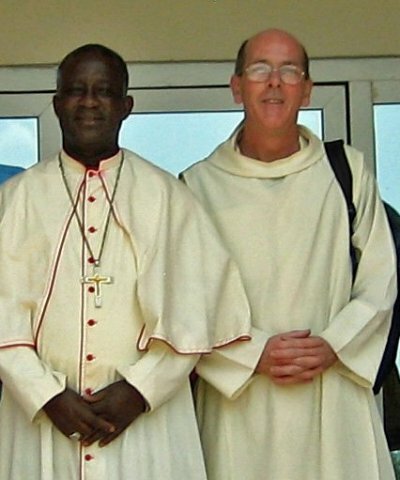 He is a monk with many hats: on this trip he came primarily as one of the Oblate Directors but he is also Bursar of Prinknash and handles Kristo Buase’s finances in England. The photos in this blog were taken by Sally Mercer. 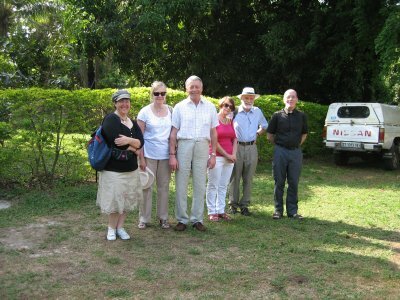 The group arrived at Accra on St Patrick’s day. The trip got off to a good start with a meeting with our own Benedictine Oblates at Accra airport. The photos begin the next day with the journey up. 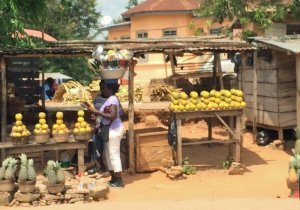 This one shows a fruit stall by the road-side. No packaging or weighing scales – you buy most things in the market by the heap or measuring tin. The woman with the head-pan is selling kitchen knives. Although the journey from Accra to the monastery is only 400 km, the journey normally takes about 12 hours. We took two cars down to meet the group since African public transport can be challenging! The busses to Kumasi are good, but after that you are at the mercy of “trotros” (minibus taxis for 16 passengers, their luggage and sometimes a couple of goats), taxis of varying standards of road-worthiness or even riding pillion on the back of a motorcycle). Driving also gave us a chance to stop several times to see things. 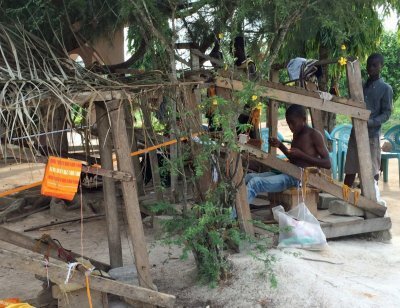 This picture is of hand weaving at Bonwire in Ashanti Region. 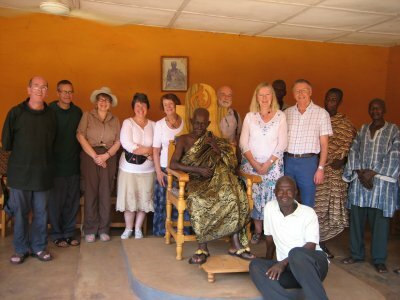 The oblates had wanted to buy a gift for the chief and this was a good place to get one: the strips are sewn together into large cloths which are the traditional dress for men in central Ghana, wrapped round the body and thrown over the shoulder like a Roman toga. The weavers used to make use of spun silk, but since – even in Ghana – six metres of spun silk cloth doesn’t come cheap, most of the cloths are now woven from synthetic fibres. This one rather bright orange. You can’t see it in the photo but the threads continue about 5 metres to the left and are pegged to the ground. The weaver is sitting under a shelter and operating a foot-pedal loom. Every cloth represents weeks of work. From left to right: Sarah Richards, Teresa & Stephen Day, Mary & Robert Jones and Fr Martin McLaughlin. Sally is missing since she took the photo. The Nissan in the background is our veteran Pick-up, 18 years old but still on the road. The local speciality is fufu. Many of the villagers will eat it two or three times a day. 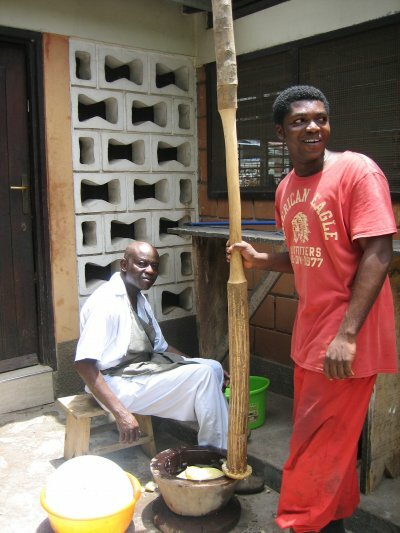 It is a mixture of yam and plantain or cassava, pounded with huge wooden pestles into a ball. The texture is something like Italian gnocchi, but the sheer size and bulk of this ball (served under soup) catches most European stomachs by surprise. Here is our cook, Stephen, assisted by aspirant Br Max-Romeo. Pounding can go on for about 45 minutes and requires a steady rhythm and excellent hand / eye co-ordination since the cook has to turn the ball by hand after each strike. Perhaps there will not be much call for this technique in the Cotswolds but Sally soon picked it up. The main aim of the trip was to visit the monastery but we had a few trips out. The first was a formal visit to our local chief, Nana Amisare Dwomo II, Paramount Chief of Tanoboase, and his council of elders. A formal visit involves relaying messages through linguists and the conversation remained in Asanti-Twi throughout. This photo was taken at the end of the meeting in the palace. Nana has been a good friend and supporter of our community since the foundation of Kristo Buase in 1989. Our monastery is built on “stool land” owned by the chief on behalf of the village. We hold the estate on a 45 year lease and pay rent annually to the Government. There are no freehold properties in Ghana outside Accra and its immediate environs. 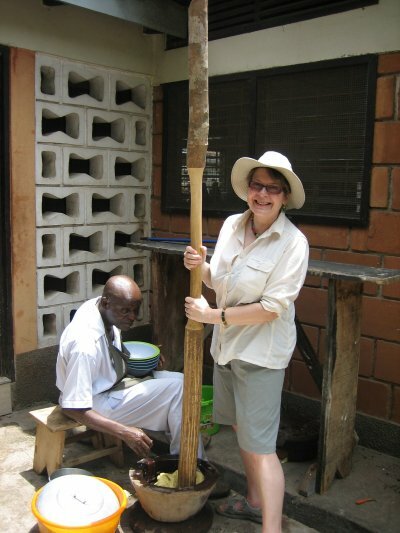 Tanoboase is important for its traditional religious sites. 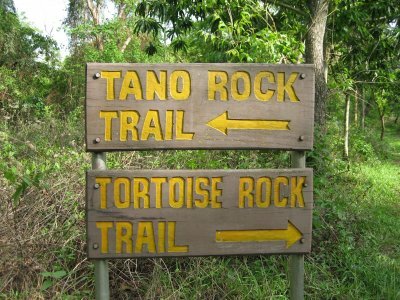 It has a major shrine to the river god Tano since the source of this sacred river (which becomes the border between Ghana and Cote d’Ivoire for much of its length) lies a few kilometres from the village. The rocks of the Sacred Grove are also home to much of the Ashanti pantheon and in consequence a large area of the village has mever been farmed and has retained its traditional vegetation. 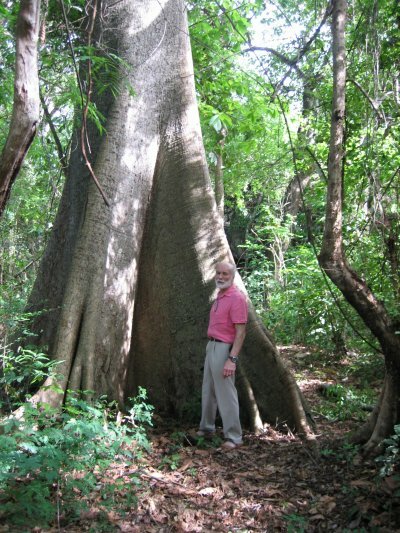 Until the 1930s all this area was dense tropical forest but in the course of the past 80 years most of the old trees of central Ghana have been chopped down for commercial timber works and building projects. 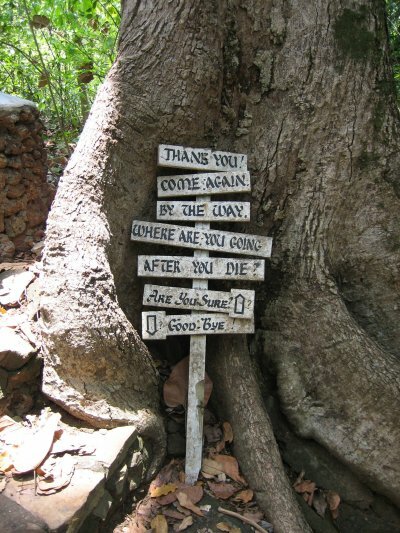 The Sacred Grove and the monastery estate have some of the last old trees in the district. 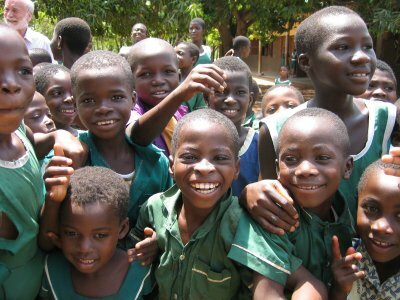 but African children always seem to be happy. 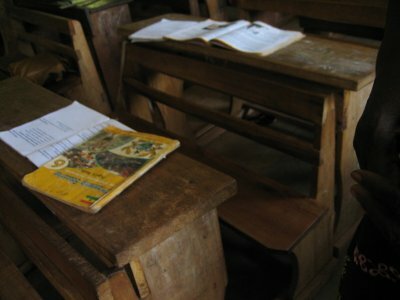 We are currently working on a project to supply the school with a computer laboratory. Contributions towards this will be gratefully received. There are several photos of an outing to Fuller Falls at Kintampo, where the group relaxed before setting off south again for the airport. Fuller Falls were developed as a Catholic prayer park by Fr Jo Panabang, SVD, although now the district has taken the site over to develop for tourism. There are still traces, though, of the former administrators! And lastly,a visit to Bishop Dominic Yeboah Nyarko, Catholic Bishop of Techiman. Thanks for sharing the photos, Sally!